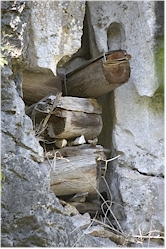 Hanging coffins and burial caves. Burial traditions differ worldwide. In some cultures the dead are cremated, in others they are sent to sea in a boat, in others they build huge monuments or hills as tomb. 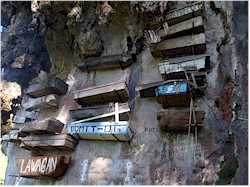 In and around Sagada, the coffins are stacked in caves high up or suspended on the rocks, because it is believed that if a person is burried up high, then the ascent to heaven would be easier. The cases are either carved out of a log or timbered from wooden boards. When you look at the coffins, you will see that some of them are quite small. They were not always made to fit the size of the person for whom they were intended. If needed, the deceased was bent to fit the coffin, even it that meant that bones had to be broken. By time, the wood of the cases deteriorates making the remains fall to the ground. So, yes, you can see bones and skulls near the foot of the rocks. These sites are graveyards, so please treat these places and the deceased with respect! Echo Valley is one of the spots where you can find these burial places and it has two advantages: it's quite close to the town where and you can see the hanging coffins from really closeby. Mind that the passage through the valley requires a bit climbing, so be sure you wear some solid shoes. This burial ritual is being performed for several centuries but nowadays it has become rare and mostly people are now burried in the ground in the cemetery. Terraces and rice fields. The Banaue terraces are called the "eight wonder of the world" in the Philippines. These terraces are found throughout the Cordillera region, thus also in Sagada. This tradition of farming goes back many centuries and is still used by the local farmers. One of the best spots to see them is from Kiltepan Hill. Sights in the town. In the town itself you can find a small museum on the Ganduyan culture, a pottery and a weavery. 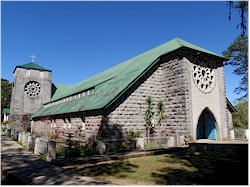 The episcopal church of the Virgin Mary was built in 1904 by American missionaries. Due to the remoteness of the region, the Spanish influence here was minimal and traditional religion and customs were preserved much longer. Nowadays in this area most people are protestant in contrast to catholicism that is otherwise dominant on the Luzon island.